United Yacht Sales New Jersey would love to guide you through a personal showing of this 41' Viking Convertible 1985. 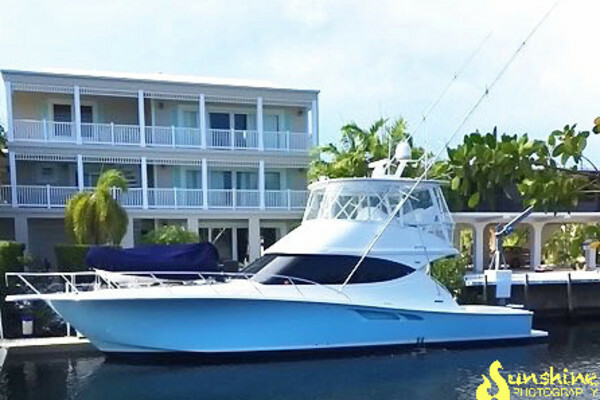 This yacht for sale is located in Wildwood, New Jersey and priced at $69,500. For a showing please contact us by filling out the form on this page and we will get back to you shortly! The 41 Viking has a large cockpit with tackle storage and fish box indeck. This boat also has engine controls in the cockpit. It hasteakdeck and covering boards. The salon is entered through a sliding door. Inside you will see a wide open layout with the galley and dinette a few steps below. The master stateroom is forward and the full head is to the port side. The helm is accessed from the bridge ladder in the cockpit. The helm is center and has all the engine controls with 12-volt switch panel for engine ignition and systems. There is bench seating with storage underneath.The bow is large and could be used for sunbathing. This boat has a stainless bow rail to make the transition safe. There is also an anchor pulpit withanchor. Solid 41 Viking with some updating will make a great boat.